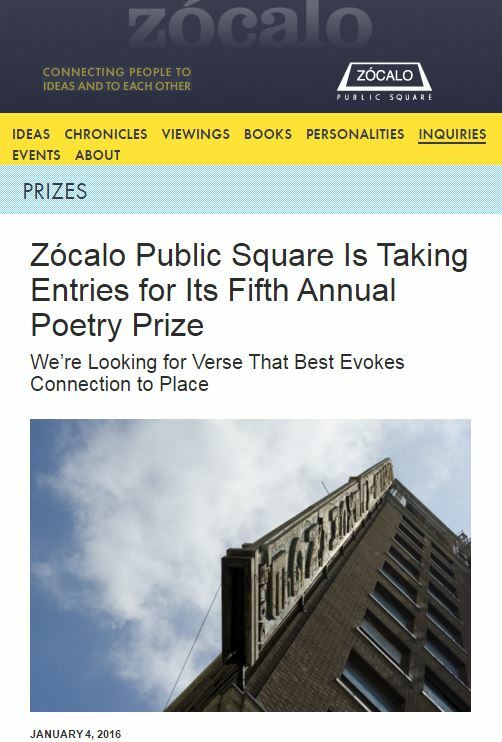 Zócalo Public Square is currently running a free poetry contest with the theme of “Place.” Poets may send up to three poems to poetry@zocalopublicsquare.org. Since 2012, the Zócalo Public Square Poetry Prize has been awarded annually to the U.S. poet whose poem best evokes a connection to place. “Place” may be interpreted by the poet as a place of historical, cultural, political, or personal importance; it may be a literal, imaginary, or metaphorical landscape. We are looking for one poem that offers our readers a fresh, original, and meaningful take on the topic. Click here for Zócalo Public Square Submission Guidelines. PRIZES: The winning poet in 2016, as judged by the Zócalo staff, will receive $500. NOTES: Previously unpublished work only. My new poem published in #thesideshow today . . .
Reblogged this on H.M. Nolan.